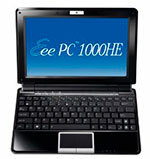 Earlier this week, TechRadar published their review of the new 10-inch Asus Eee PC 1000HE. They found the claim of 9.5 hours of battery life to be really pushing it – they were able to get over seven hours of regular usage out of the battery, but they compared it to the Samsung NC10 (also known for its battery life) and found that the 1000HE held its own. They also found the new chiclet-style (or Scrabble-style) keyboard to be easier to type with. They gave it high marks, basically saying that if you already have an 8.9-inch or 10-inch netbook/ultraportable, it’s probably not worth upgrading, but if you do, then this might just be the one.